The Internet of Things (IoT) is one of the most promising technologies, along with the distributed ledger technology (DLT) – also called blockchain, artificial intelligence, and a few others. ANAPP Blockchain Technologies Limited, a blockchain-oriented startup, plans to merge IoT with blockchain for an innovative infrastructure that would allow users to mine digital currencies with the help of any electronic device and home appliance that can act as an IoT device. IOTW, as the new project is called, will use blockchain to provide a better alternative to the popular Proof of Work (PoW) and Proof of Stake (PoS) consensus algorithms. IOTW proposes Proof of Assignment (PoA) – a completely new approach that solves some of the main problems inherent in the traditional algorithms. The ecosystem is fueled by IOTW coins, which allow high-speed micro-transactions. Some may find IOTW quite similar with IOTA, a popular project that combines a distributed ledger system with the IoT concept. However, IOTA doesn’t use an actual blockchain system but an architecture called Tangle, and more importantly, it doesn’t perform as well as IOTW. Bitcoin is by far the most popular and oldest cryptocurrency, and today most of the miners would target it given its high price. However, the competition became fierce and retail miners don’t find it profitable to generate new Bitcoins, which has led to the formation of a monopoly where companies like Bitmain are dominating the market. Besides, the PoW algorithm used to mine BTC requires much electricity, which has negative consequences for the environment, especially when the electricity comes from coal-based power stations. IOTW proposes a new approach to mining. 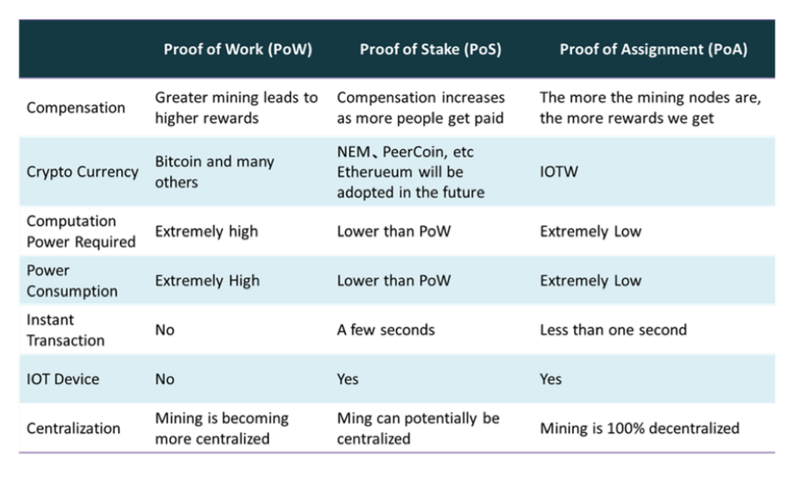 The Proof of Assignment (PoA) algorithm requires less computational power and less memory capacity compared to PoS and especially PoW. 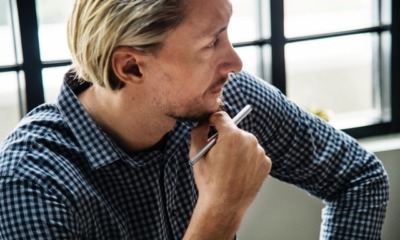 With the new method, those who have more IoT devices connected to the IOTW ecosystem have the chance for higher profits. Thus, typical home appliances can generate IOTW coins without significantly impacting the electricity bill. 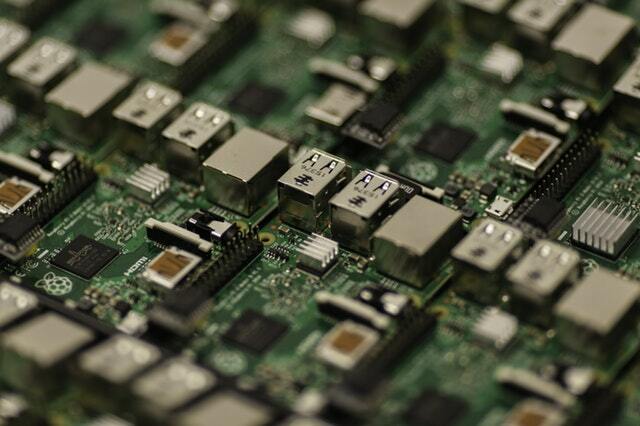 You can think about it as micro-mining, as it doesn’t require advanced processors like those found in the ASIC devices. However, the potential profit is worthy of consideration. IOTW blockchain solution will be open-SDK so that any IoT and connected device can download their app to join the ecosystem and start mining. However, the devices don’t have to download the whole blockchain to become eligible nodes, so no significant memory capacity is required. If a mining equipment unit to generate new Bitcoins can cost you over $2,000, then IOTW lets any IoT device become a miner. Besides, the system allows typical electrical devices become suitable for the IOTW ecosystem by integrating a special DPS chip that replaces their traditional analog power systems. 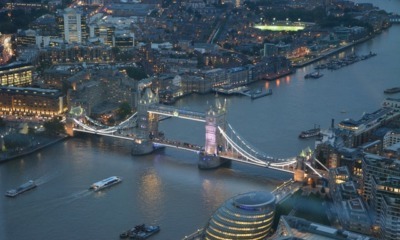 This procedure would convert the appliances into IoT devices that might be used for mining. The IOTW team will work to promote the project and make the coin be accepted for as many business cases as possible. The team will have to partner with goods and services providers to make the IOTW token work as a payment method. Besides, the ecosystem will be used to collect and sell data for device owners, which will represent another use case for the token. Last but not least, IOTW coins can be conveniently used for peer-to-peer transactions between members. The IOTW project is at its nascent stage, but it definitely has a great potential for the future. The ecosystem, which is backed by an expert team, can literally reach millions of users around the world by allowing their home applications to generate profits through the new concept of micro-mining. The blockchain community would rapidly adopt IOTW given that it addresses some of the key issues that are characteristic for the PoW and PoS algorithms. The IOTW team has already filed three patent applications for inventions related to the Proof of Assignment algorithm and other software and hardware solutions. The startup intends to file for more relevant patent applications by the end of 2018. As of July 31, 2018, the IOTW project has raised about $4.14 million, and the testing version of its system hosts over 200 micro-mining IoT devices. The token sale is still continuing, so potential investors are free to apply to join the whitelist. NEM (NEM) or Ripple (XRP), which cryptocurrency is the best bet right now? Is CCRB’s New App The Latest Big Shot In E-Tail And Mobile Mining? CCRB to launch a dedicated consumer-oriented app allowing users to Shop, Trade, and Earn. While companies like Coinbase with their e Gift cards are just about to knock the doors of this multi-billion dollar market, CCRB has already unlocked a host of opportunities for thousands of consumers from all across the world – including mining through their mobile device. Cryptocarbon, a UK based, consumer-driven Blockchain venture is proud to announce the launch of its power-packed CCRB App. 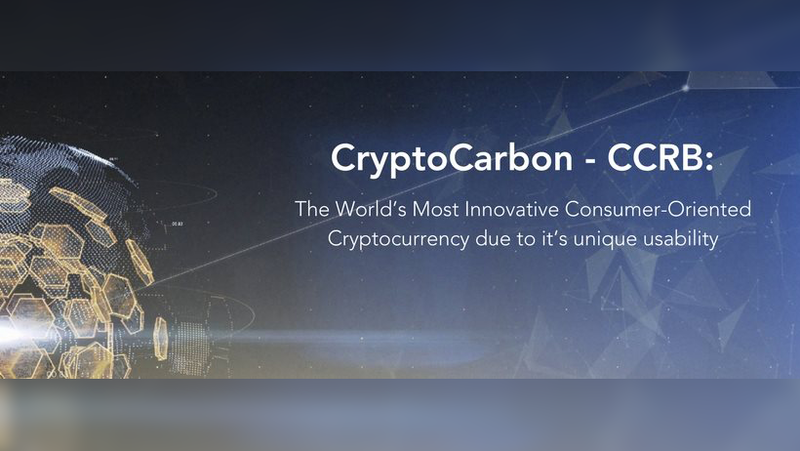 The new Crypto Carbon App is particularly designed for crypto lovers all across the globe – it allows users to shop with 100% payments made in cryptocurrency – there is no getting a new card or paying in fiat. The new app is loaded with features as it also allows users to swap between 6 major cryptocurrencies and allows for crypto mining right from their mobile devices. For every Genesis, there is an End. 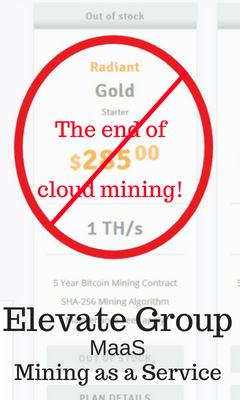 As the founder of Elevate Group, which is a managed co-hosting facility for bitcoin mining, I went to great lengths to analyze how both the mining ico’S are structured and how cloud mining operates. So I believe I’m particularly well qualified to write this article, and I hope the reader gains from it. Yes, this is also a marketing piece about Elevate Group, but there are no gimmicks or ‘specials’ or anything like that, I just point out the relevant truths and ask some pressing questions about the industry as a whole. All my numbers are derived directly from the companies websites, all this information is factual and I encourage you to check them for yourself. About two months ago, the Monero community was vexed in a war of words with Bitmain over the release of the Cryptonight –capable Antminer X3. The Antminer X3 had been designed to mine altcoins that use the Cryptonight hashing algorithm with Monero as the main mining target. As usual Bitmain (world’s biggest manufacturer of ASIC mining hardware) happily announced its release. However, in response, the Monero Blockchain was forked to maintain its ASIC resistance rendering all the new Atminer X3 obsolete. Basically, there has always been a fight for control in the crypto mining world. Mining equipment manufacturers like Bitmain are currently able to control the crypto landscape as they wish since they equally control who gets what mining equipment, when and at what cost. The general feeling has been that the rich get richer while amassing more control over the Blockchains as eventual centralization of the networks is realized.